We’ve been in South Africa for just over a week and we are still wrapping our heads around being here. Today one of the girls reminded me about the day Panama public school was closed because of a swarm of African bees. “We are in Africa now, Mom!!”. Later in the day, at a homeschool meet-up, we heard about some butterflies that migrate from South Africa to Mexico. What!? That’s kind of like what we did, but the other direction. Connections are already being made between the countries we have visited and it’s awesome. The first few days of driving (read: riding in an Uber, sitting on the left in what we think of as the driver’s seat), I found myself not liking Johannesburg. I was so used to Spanish cities and towns where you turn a corner and you find a charming plaza or lovely statue or a long, nicely maintained promenade. We were not seeing any of that as we transited around town and I began to wonder why so many people were here and what appeal the city held. 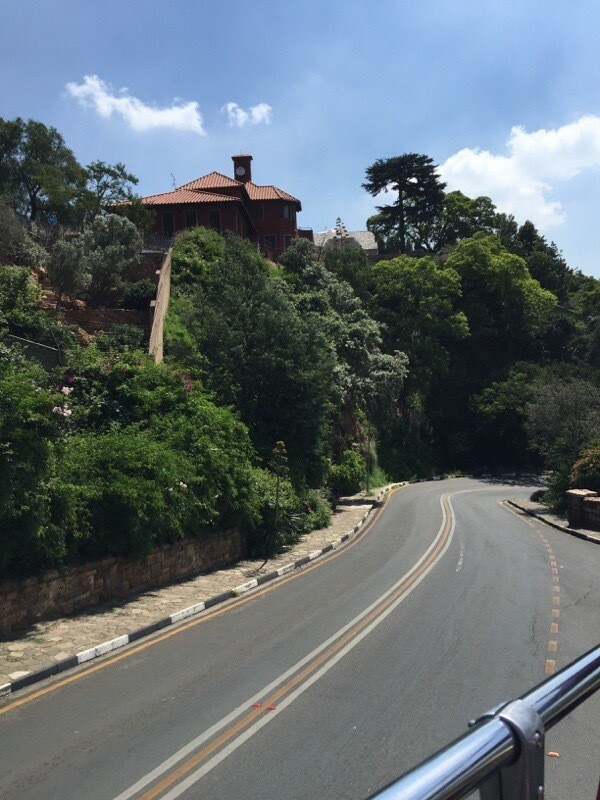 We took a hop-on, hop-off bus tour on Sunday to see more of Johannesburg and it really opened my eyes to this massive city. Only 130 years ago this place was a barren plain with various animals grazing on it. But, long story short, gold was discovered and people came by the thousands to get a piece of the action. Mines sprung up and with mines you need a lot of timber to support the walls. For that reason they planted trees. So. Many. Trees. 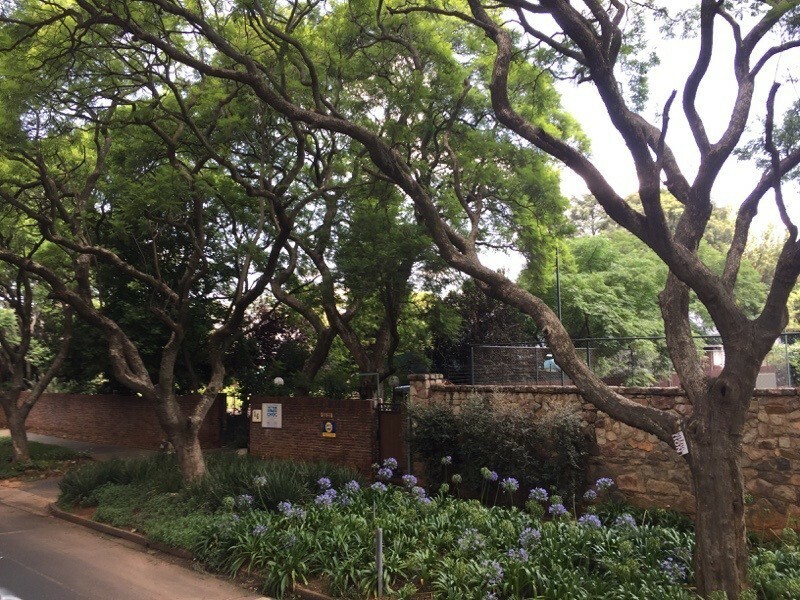 Joburg is affectionately called The Largest Man-Made Forest in the World and driving around town I believe it. 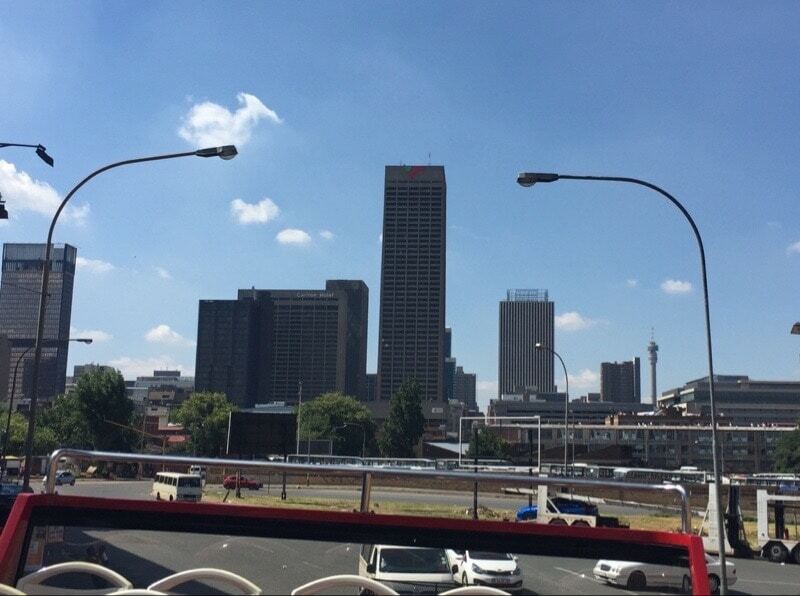 Some of Joburg from the tour bus. 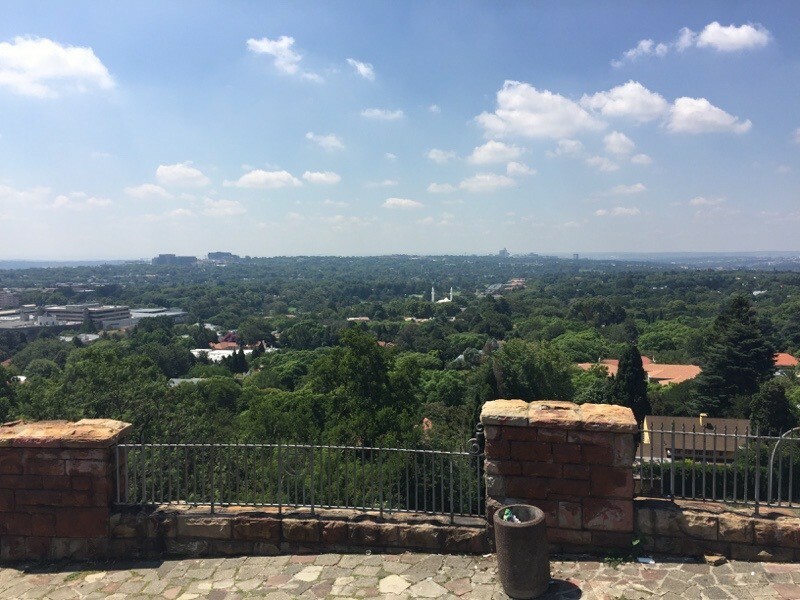 This is a view of Joburg from Constitution Hill. Look at all those trees! A Joburg street. More trees! These trees are very common here, but they are nearing the end of their life cycle. New ones will not be planted, however, as this particular tree consumes way too much water and is not helping the water shortage that exists in South Africa. But for what the city is lacking in charm and long history and quaint-ness it makes up for in a fantastically interesting complexity of racial and cultural history. Boy is it complicated and I’m not just talking apartheid, but even before that with the Portuguese (who developed Cape Town as a refreshment stop for their boats coming back from India), the British as well as the Dutch who all played a role in the history. Interesting factoid: the money here is called the Rand. The mining bosses who became very rich and built big mansions are referred to as RandLords. Just seeing their houses and hearing how they were such a huge part of the history, you get a sense for how it was. It feels very much like the Civil War era in the Southern USA with big Gone-With-The-Wind like mansions and estates. One of the oldest schools in the city. 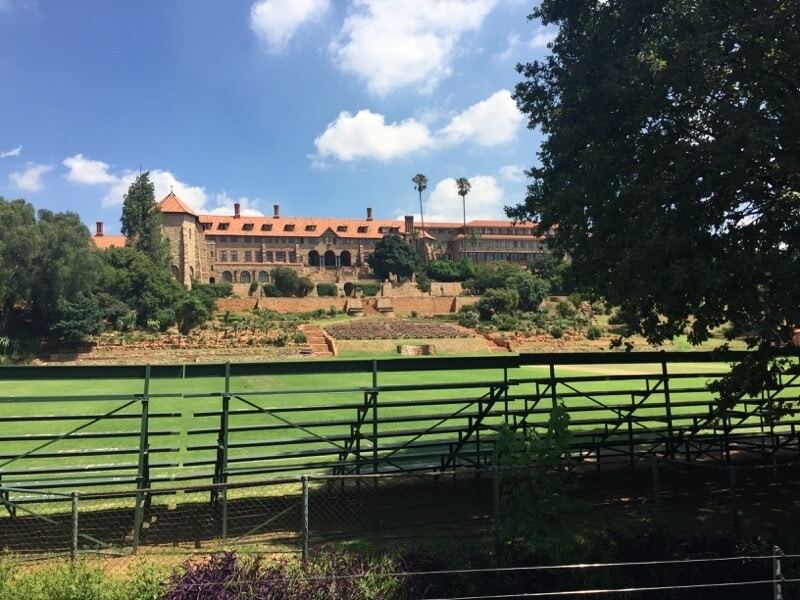 RandLords would send their kids here for their education. Apartheid was abolished in 1994 and we certainly do not see any evidence of forced segregation, but the social segregation remains and it’s clear that certain areas of town, schools, and jobs remain traditional for one race or another. I have seen very few interracial couples nor groups of friends from both races. I’ve seen very little animosity between races, but I am sure it exists and I would not possibly be able to sense it. So instead of finding charming plazas and old buildings and long promenades to stroll along at sunset, we are finding history and education and grit. It’s fascinating. We will perhaps learn more here than anywhere we have been. The lessons to learn here span so much of the human experience. We are currently watching Mandela’s autobiography which was made into a movie in 2013. The girls are paying closer attention to this movie than most documentaries we have watched. Already we have visited multiple places depicted in the movie and when we go to the Apartheid Museum later this week I think there will be multiple “aha” moments. Jozi (or Joburg) is situated high in the “mountains” (actually rolling grassy hills), higher even than Denver, at 5700 feet. We seem to have adjusted to that well, with only a mild headache for the first day or two for some of us. The city has enormous water challenges, as it’s the biggest city in the world that’s not situated on a river or an ocean. They catch water from the regular rains that fall but since the watershed boundary (Africa’s version of the continental divide) runs right through Joburg, the city’s watershed only benefits from the rain if it falls on one side of town. And the line is really clear. A few meters one way and other places benefit but not Joburg. In addition, they estimate that 40% of water is lost through poor water management and infrastructure problems. All over the city you see signs about conserving water and residents are taxed heavily if they exceed their monthly allotment of 6KL (1,500 gallons). It reminds me a lot of Panama with the challenges they had getting water to Pedasi. Evidently Joburg and SA in general also has a challenge with electricity, having not upgraded the infrastructure and now finding that the grid is failing. They have contracted to provide power relief to some nations north of here with power first, so only after those countries’ needs are met does South Africa have what’s left for it’s needs. Not sure of the details on that, but it sounds crazy. Despite being one of the world’s top sunniest countries, solar power is not a thing here BUT they are expecting to have nuclear power within 2 years. Again, shades of Panama and the weekly power outages. We have not experienced those problems in the mere “skimming” that we have done by living here for 1 week. When we move to our Airbnb where we will stay for 3 weeks perhaps we will see more of these city issues, or perhaps we will narrowly miss them during our time here. The weather here has been lovely. We have used A/C for parts of every day but most of the time we stay nice and cool and enjoy being outside. The temperatures are coolish, but the sun is warm when you’re out in it. Our new Airbnb has a pool but for these Arizona residents, we aren’t sure if it’s up to our temperature standards. One thing we are really appreciating is the English spoken. We laugh when people say they love our accent, and we sympathize when waiters and Uber drivers can’t understand us. But English just makes things so much easier. Dan and I can be co-Cruise Directors! Grocery stores are easier to figure out. Google maps works! We can read the signs and plaques and understand the meaning! Another thing that is making a huge difference is that homeschooling is legal here. 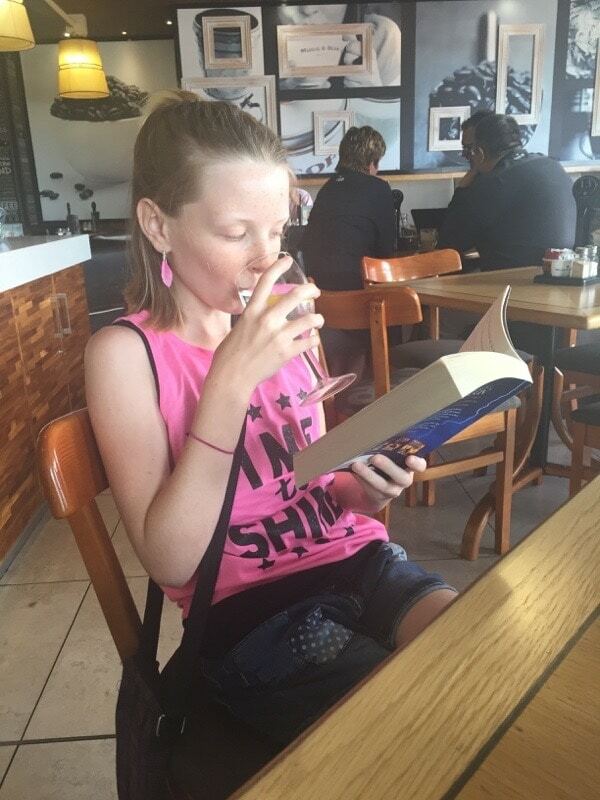 Homeschool in Spain is a very grey area legally and very few people are doing it. But in South Africa it is starting to take hold and the homeschool groups are loosely organized. There are meet-ups and classes and social events with other kids. 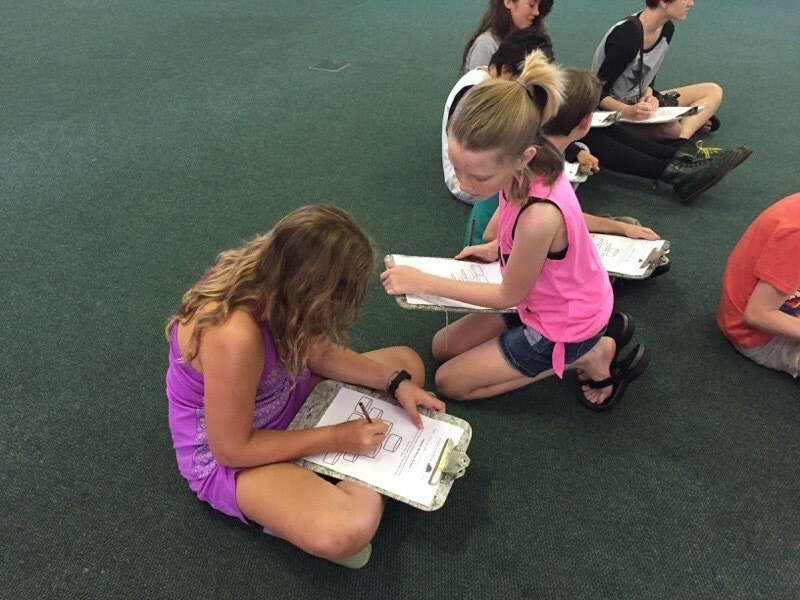 Recently we went to a social event where the girls took a class on insects with other homeschoolers. The insects themselves were only mildly interesting, but the other kids we met were fantastic. Friends were made, plans were created, numbers were exchanged. We feel refreshed and inspired. 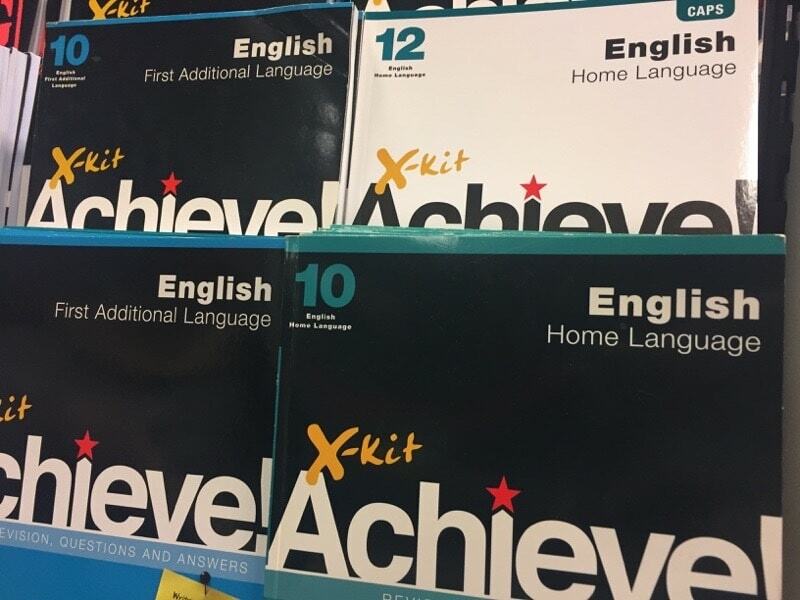 Those two things: English and homeschool – could possibly be the magic formula that helps us feel comfortable in a country with much less effort and angst. The girls are becoming very fluent in Making Friends Fast. 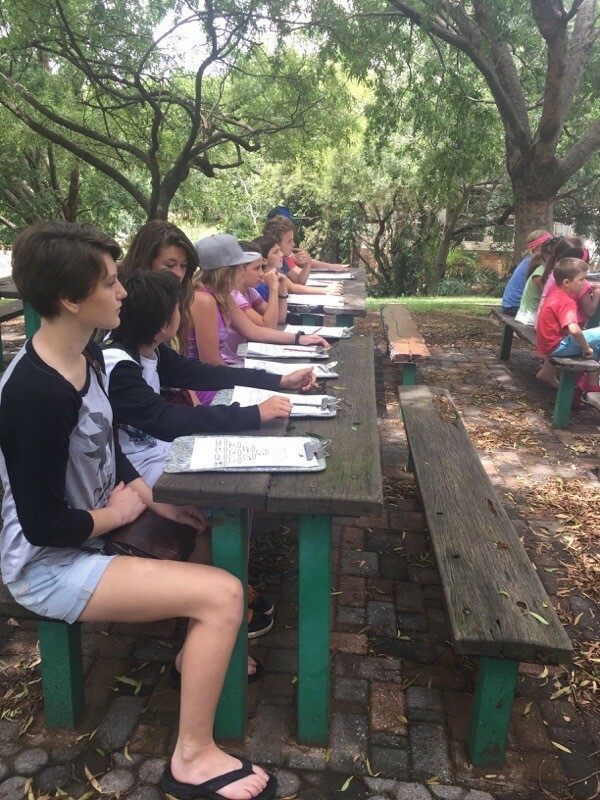 Outdoor classroom. Haley was paying more attention to the birds around her. There is so much to do here that our list grows by the day. We’ve had a few days “in” – working on homeschool – but those days will probably be few and far between. Museums, social events, tours and activities all await us and we can’t wait to dig in and see what it’s all about. Digging in is so much easier in English. English workbooks. Most people speak Afrikaans and English. I love how this book is for FIRST Additional Language. Because there is more than one additional language! We discovered that when you buy Zoe a real book, she’ll read a lot more willingly than when it’s on her Kindle. Well worth the luggage weight. Cheryl, yes! I’ve found multiple groups of homeschoolers on FB and they are lovely, friendly, helpful people! I’ve had multiple invitations to get together and our calendar is starting to fill up with events, including ice skating. It’s really wonderful.